It’s significant that the godfather of the Tea Party movement (the original form of it, anyway) includes wealth redistribution in his principles of liberty. It points up an area where these two movements can either come together or get driven apart. There’s no question about where #ows stands on this point. Income inequality is a key symptom of the disease #0ws arose in response to, and one of its goals, I would argue, is to force a correction of what it views this to be: a moral wrong. If Paul is any indication (and I’m sure he is), the Tea Party is not so much troubled by this gap as it is by the idea that government should try to close it. …Americans in the bottom fifth of earners saw their incomes increase by less than 20 percent across the nearly three decades. Incomes for those in the middle 60 percent climbed by less than 40 percent over the same span.Things start to look especially good for the top fifth of earners, who saw their cash flow jump by 65 percent. This, of course, is not really news. The gaping inequality gap in the US has been pointed out by think tanks and news media with greater frequency since it first became obvious in the 1980s and only accelerated since. To dramatize that fact, here’s a graphic from Mother Jones. What is astonishing is that the causes of this gap are apparently poorly understood by economists and rarely if ever talked about by policy makers. Many point to globalization, it’s true, arguing that workers in industrialized countries like the US are now in competition with workers in developing nations whose pay scales are much lower. Some blame automation, some illegal immigration. Some blame the workers themselves for declining aptitudes or ambition that would bring in higher wages. That the US government has had an economic policy for the past 30 years designed to favor the financial class is rarely mentioned as a cause. And how do the experts suggest we deal with this situation, which some don’t even deign to call a problem? Neoliberals, who arguably caused it with their successful bid to make their anti-regulation, pro-wealth philosophy the default economic policy position in Washington and London for the last 30 years, caution against the most obvious tack, raising taxes on the highest earners and lowering it for others, because of the alleged harm it would cause the economy–as if intractable inequality in itself is not a sign of an economy gone horribly wrong! At a statistical level, income inequality has grown due to gains of higher-income (above median) households relative to the median, rather than losses of lower income households relative to the median, which has been occurring roughly linearly (on a log scale) since the 1960s, as indicated in chart at top. 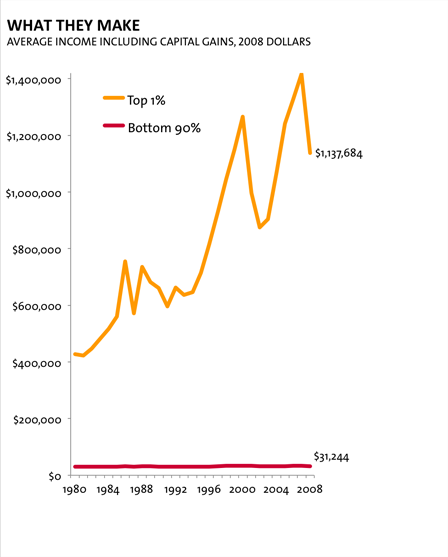 Income inequality has grown particularly due to increased concentration of income in top earners (top 1%, .1%, 0.01%) since the mid-1980s. If all other classes were able to keep pace with each other while the economy grew, how was it that the very top was able to accelerate the concentration of wealth in its hands? If we consider this pathological disparity in US society an ill rather than a fact of life, isn’t this the key question to focus on? It isn’t just that the wealthy are being taxed at a lower rate than they were 40 or 50 years ago. David Leonhardt of the New York Times observed in an April 2010 column an astonishing fact, that while the top 1% of earners were paying a greater overall share of federal taxes than they used to, their rates have fallen far more than those of the rest of us. So what’s the full story? 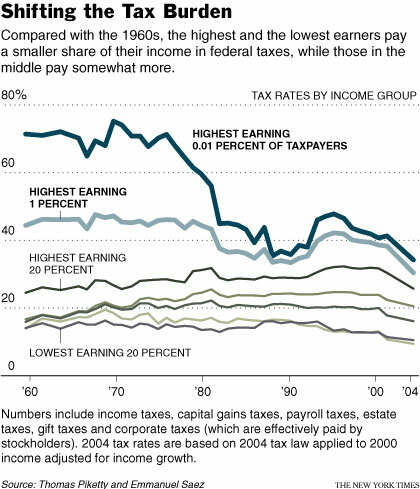 In brief, tax rates for the wealthy have fallen more than for other income groups. Tax rates for the very wealthy have fallen more than they have for the merely wealthy. Incomes at the top have also increased much more quickly than incomes have for other groups. Add it all up, and you can see why the wealthy are paying a greater share of federal taxes even though they are paying less tax on each dollar they earn. They’re simply making many more dollars than they used to. To summarize all the above: It appears that the inequality gap in the US has been caused by a combination of legalized looting of public resources by the financial class and tax policies that have favored them above all other classes in the society. This is, in effect, a government underwritten redistribution of wealth away from the bottom 99% toward the top 1% and, therefore, it would seem to violate the Paulist principle that starts this article. #OWS, I believe, unlike the Tea Party, suggests an answer to that question: a revolution is necessary. The government is the problem, but not just because it is a government, which seems to be the foundational prejudice of Paulian Libertarianism. The problem with this specific government is that it serves the financial class. What is needed, #ows suggests, is a government that serves the rest of us as equal shareholders. This is the fundamental point that needs to be resolved between #ows and the Tea Party if we are to unite in common cause to end the government-sanctioned destruction of the middle class. I believe Paul and the Tea Party would agree that government has been privileging the wealthy and that this is the ill that needs to stop. But we need to answer for ourselves what kind of government should replace this dysfunctional one that is causing all our common miseries. What do we want that government to do for us? The Tea Party is very clear on wanting it to do as little as possible. #OWS, on the other hand, is very clear in wanting the government to do our express will. Somewhere in that debate is the answer to the problem. But we must have the debate. #OWS is prepared to have it. It’s time for the TeaParty to man up, if they will, stop villifying their counterparts on the left, and engage seriously. This entry was posted in Democracy, Economics, Politics, The Ten Principles of a Free Society and tagged #OccupyWallStreet, Catherine Austin Fitts, Economic inequality, Freedom, government, income gap, inequality, revolution, Ron Paul, Tea Party, Wall Street. Bookmark the permalink. Good luck! In order to have an honest debate members of the Tea Party would have to take off their blinders and admit the abysmal failure – intentionally designed – of conservative economic policies. Which in my opinion will never happen! Luck truly may be needed at least as much as skill in getting the two sides to meet. I think the far right Christian-oriented contingent can be written off entirely. But the Paulians may be approachable. I’ve dialogued with them and I can see potential for collaboration there somehow. As I point out in this piece (which I wrote over a year ago), Paul’s principle here, principle number 4 for a free society, is violated by the 30-year practices of both parties, which have massively redistributed wealth upwards. I’d like to think they can see that. The Chrisian Repubs definitely can’t see beyond their noses. But the Paulians are a bit better (or like to think of themselves as better, which is a good sign) at reasoning and logic. It won’t be easy, but anything has got to be better than the “bipartisanship” of the government. I also think that repealing the 17th amendment would help. The Senate is supposed to consists of representatives of State governments. Going to the direct election of Senators has made them dependent on campaign contributions. That is a problem. I think the road to an all-around more agreeable solution is increasing direct democracy as much as possible, making government much more accountable to the people–all of the people, all of the time. Delegation and compartmentalization of politics has concentrated power in fewer and fewer hands, and that in itself perpetuates corruption. Our whole American system is neck deep in corrupting delegation and needs to be scrapped, in my opinion, even at the state level. I wouldn’t just throw out the 17th Amendment, I’d rewrite the whole thing, taking into account that we are no longer an agrarian market society but a globally wired society. I can say a lot more about it when I have time. In any case, thanks for your thoughts about this!